Water-rockets science for hobbyist, students, and teachers of all ages. Are you working on a school water rocket contest? Do you like building your own, rather than buying a kit? Do you need a computer simulation to help predict performance and improve your design? 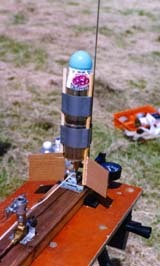 For over 10 years water-rockets.com has presented the science and adventure of high-pressure water rocketry. Hobbyists and students have used our java-based water-rocket simulation to design water rockets, and to explore how they work. Many people of all ages from around the world have written to us with questions, comments, ideas, and achievements to share. Our Frequently Asked Questions pages address many of these questions with articles, images, video, and links to other resources. As always, we appreciate your feedback and ideas for making water-rockets.com better. Please use the message form below.